It's time for Ricky Feeple's rematch with his most feared enemy, the psychotic vampire Kyonshi, who nearly killed him. 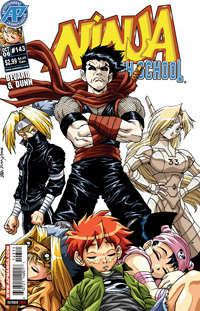 Now Ricky's got an entire squad of young ninjas on his side, but they're still outclassed. It's an all-out battle of revenge, life and death with the life of an innocent baby heiress to a multibillion dollar ninja empire on the line! And when the dust settles, at least one of the young ninjas will never fight again!